Sometimes, people want to play a game that takes us in a different direction. Many games force us to play as the good guys, the winners, and the A-team. Sometimes, we want to experience a particular series from the perspective of the bad guys, the losers, the B-team. Capcom had an idea for one of their franchises for the PlayStation. 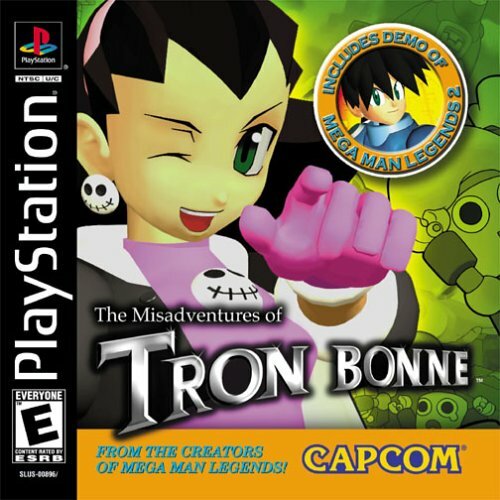 A prequel to the iconic Mega Man Legends was developed and released for the system: The Misadventures of Tron Bonne. Is it fun to play as the Bonne family or is it better to be good? The Misadventures of Tron Bonne begins when Teisel Bonne decides to head out to Ryship Island to explore the Nakkai Ruins in search of treasure. He takes along Bon Bonne and the servbots, but has Tron stay behind in order to protect her from danger. Before they can enter the ruins, they are attacked by Glyde. It is revealed they defaulted on a 1 million zenny loan from Mr. Loath. The loan was taken out by Teisel to build the Gesellschaft, but in the end caused him to get captured. With Teisel in the clutches of a greedy loan shark, It is up to Tron and her servbots to repay the debt and rescue him and Bon from the clutches of Glyde and Mr. Loath. The Gesellschaft is the main hub for the game. This is an action-adventure game with strategy elements, but unlike the rest of the Mega Man Legends series, it contains multiple gameplay styles divided up into missions. Players can choose to play action stages, puzzle stages, an RPG stage, or explore the Nakkai Ruins for rare and valuable treasure. There are 15 missions total with each mission containing three levels. Action stages have the players looting and taking items. This is a good way to increase both the zenny count and find key items to make the game easier. The action stages have Tron going to Sart Farm to steal animals and go to Gold City to rob the bank. 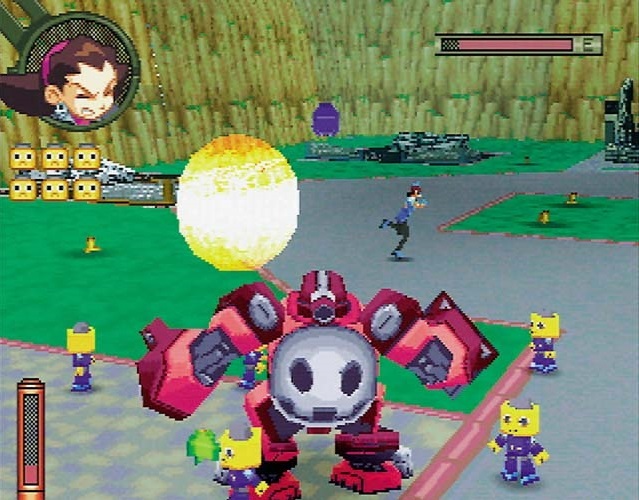 Tron uses the Gustaff, a powerful mech, during these missions to fire at obstacles, pick up items, and throw beacon bombs at objects and places to command her servbots to go collect items and zenny. The Gustaff starts off weak, but can be upgraded with energy tanks, armor, and new weapons. Upgrading the Gustaff is as simple as taking key items to the Lab and having specific dev servbots build the upgrades. With enough zenny, the Gustaff will become a powerful tank with the option to shoot bazookas and multiple shots. The lone RPG stage is a dungeon-crawling stage in a first-person mode. The goal is to find treasure within the caves and find the three aurora stones to sell off for money. The Nakkai Ruins is a free exploration stage. The ruins are full of treasures and enemies to defeat. This is the place to go to grind for zenny. Puzzle stages involve Tron picking up various crates in the harbors around Ryship Island to move out of the way or create pathways. The goal is to load all the item crates to the ship. The key is to carefully plan out your moves as the Gustaff Tank can only move 10 steps and can only lift so many crates. This is easily the most challenging part of the game, yet the most rewarding portion as it challenged my brain. The puzzle stages are also forgiving as players can start all over again or go back one move if they make a mistake with no penalty. The Gesellschaft is the main hub inside the game. Tron can interact with her 40 different servbots and find out some key information and unlock their potential. There are various rooms such as a cafe, storage room, lab, and gym. As the game progresses, more rooms are unlocked inside the Gesellschaft as they are built. Every servbot has their own alloted stats and special skills. These special skills include developing weapons and armor, paining, poetry, snipers, and other useful skills for the adventure. The stats include attack, speed, brains, and sloth. Unlocking a special skill is as simple as giving a key item to a specific servbot or taking the servbots with you on a mission. There are some training courses in the training room to help servbots increase their speed and attack. The mini games start off easy at level 1, but become increasingly more difficult in the higher levels. Before the start of each mini game, the rules are explained so the player can quickly learn the games. Mastering the mini games will take lots of practice. The game encourages you to develop all of your servbots and use them. The sloth stat will increase if a servbot is inactive. If a servbot’s sloth reaches level 4, they will not help you out until you complete a mini game in the torture room. I only had this happen to me twice during my playthrough of the game, but believe me, the 30 second torture mini game is not easy to complete as the margin of error is slim. Once the mini game is complete, the servbot’s sloth level goes down to level one. Before starting a mission, Tron can send out up to three servbots to scout the island for various goods to either use or sell off. It’s another way to keep the servbots active. The art style for the game is similar to the rest of the Mega Man Legends series. It is colorful, simplistic, and charming. Like other 3D PlayStation games, the graphics have aged a bit, but still looks good for the time. The music is fantastic and is arguably the best soundtrack in the Legends series. The tunes are catchy, yet quaint in each area. It keeps you focused and alert and does not put the player to sleep. 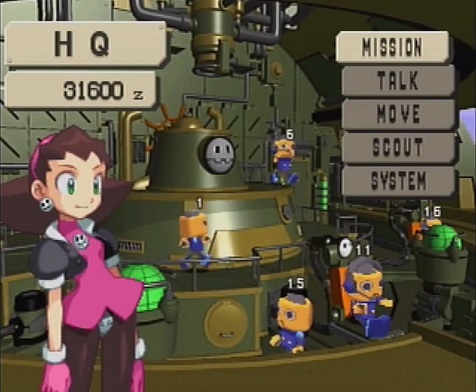 The Misadventures of Tron Bonne is a good classic action-adventure game incorporating both strategy elements and different gameplay styles such as puzzles to solve, caves to explore, and things to collect in the action stages. It sheds a different light on Tron Bonne and her brother Tiesel. Playing as the villains is fun and is a refreshing way to play an action-adventure game. Thanks to the PlayStation Network, the game is now affordable to purchase as it is no longer necessarily to plop down over $100.00 on a physical PlayStation disc copy. If you have not experienced this cult classic and you own a PlayStation 3 or Vita, I recommend downloading the game from the PlayStation Network. This review is based on the PSN version of the game.